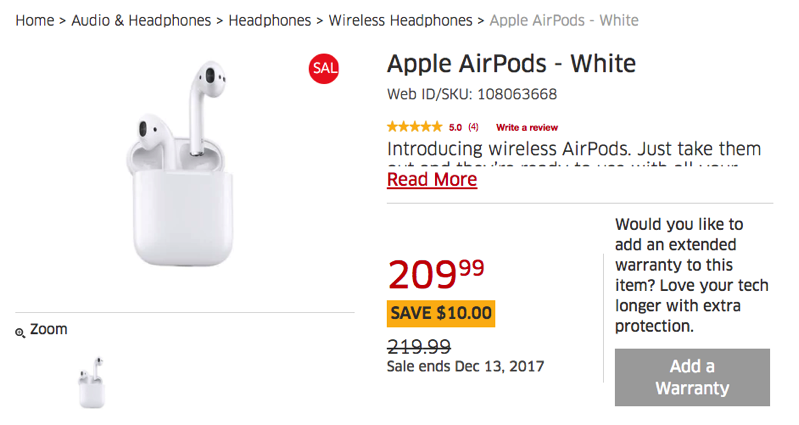 If you were about to pick up a set of Apple’s AirPods wireless headphones, head over to The Source, as a sale right now offers $10 off, taking the price down to $209.99. While the sale isn’t exactly huge, AirPods rarely go on sale, ever. Stock is showing as sold out online, but in store availability is showing. You could try price matching at Best Buy to save another dollar (insert Russell Peters save 50 cents/dollar store joke). In the past, some have been able to apply the Parter Savings Program (PSP) discount to AirPods at The Source, so there are other ways to save on these wireless headphones, which are a must-have for any iPhone user with multiple Apple devices.